At this year's SuiteWorld, NetSuite announced key architectural changes, their version of an omni-channel strategy, many new capabilities by vertical industry, and a new IDE for their SuiteCloud platform. In addition, I discuss NetSuite's approach to getting deeper vertical functionality for their ERP customers. NetSuite’s annual user conference, SuiteWorld, has a more relaxed and light-hearted vibe than the conferences of more traditional enterprise software providers. 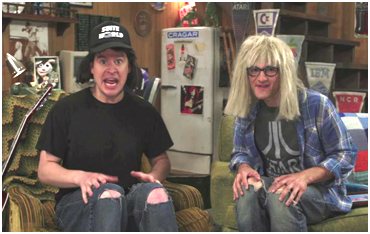 Who else would start off their opening keynote with their two top executives dressed in wigs and costumes to look like Wayne and Garth of Wayne’s World following this Wayne’s World parody video? This is a reflection of NetSuite’s culture and their customers seem to love it. Attendance, at about 3,300, was up 50% from last year. NetSuite actually had to turn away people who wanted to attend. It also seemed to me, from talking to NetSuite’s customers at the show, that they display a level of enthusiasm and excitement rarely seen from the customers of NetSuite’s longer-established competitors. Starting from a much smaller size, NetSuite has grown at a much faster pace (84% over the past three years) compared with the larger and more established players. Q1 2012 revenue for NetSuite was $69.3M, with cash flow of $10.6M, 15% margins, and estimates of $300M revenue for FY12. They also grew their R&D headcount by 50% last year1 and will grow it another 50% this year. NetSuite’s CEO, Zach Nelson, likes to say their focus is the ‘Fortune 5 Million.’ NetSuite added 300 new companies last quarter, most of them under $1B firms. But they also have seen success with large companies such as Knowledge Universe and Groupon, as well as subsidiaries of larger companies running SAP, Oracle, and other legacy ERP systems at corporate headquarters. Examples include P&G, J&J, MetLife, Fujitsu, Qualcomm, Pitney Bowes, and Land O’ Lakes. These companies are seeking a faster and less expensive way of deploying subsidiaries than just implementing another instance or extension of their corporate-level ERP system. During his keynote address, Zach made a dramatic announcement that NetSuite just signed a deal with the subsidiary of a well-known Global 2000 technology company … (dramatic pause) … which is SAP. The reaction of many was “Wow, really? That gives you some serious bragging rights.” It turns out that subsidiary is SuccessFactors,2 recently acquired by SAP, who was already a NetSuite customer. In fact, according to SuccessFactors, they are in the process of switching to SAP’s Business ByDesign. Still, it made for an entertaining and attention-getting announcement and chance for NetSuite to rub it in a bit to their rival. The central announcement of Zach’s opening keynote address was the launch of SuiteCommerce, which Zach also referred to as Commerce-as-a-Service. This reflected a focus on supporting omni-channel business. I saw a similar theme central at both JDA’s Focus and Manhattan’s Momentum conferences this year. Whether B2B or B2C, almost every company now deals with multiple channels—direct sales/brick and mortar, eCommerce, call center/catalog, etc—and integration of the customer’s experience across those channels is becoming more and more of a base requirement to compete. Of course NetSuite comes at this from a quite different direction than their more traditional peers. JDA (with its Manugistics, i2, and E3 acquisitions) and Manhattan were started in the pre-internet era, focused on brick and mortar issues. NetSuite started at the height of the dot com frenzy and has had a strong focus on eCommerce from the start. While this eCommerce front end is integrated with their financial back end and CRM front end, NetSuite has historically had less strength in deep supply chain and logistics functionality compared to JDA or Manhattan. Each company’s heritage has influenced its approach to providing omni-channel integration by leveraging their strengths. Building on their ERP, CRM, eCommerce, global3 foundation, NetSuite has re-architected their solution. Previously, customers’ options for customizing their eCommerce solution from NetSuite were somewhat limited. For example, you had to use NetSuite’s built-in checkout page. About 18 months ago, NetSuite started working on exposing a new series of APIs,4 called SuiteCloud Commerce APIs,5 enabling a much higher degree of customization and control. Further, these APIs enable plugging in NetSuite’s back end to other front ends, including POS, mobile apps and even, in the future, other machines. This re-architecting coincided with NetSuite’s hiring Andy Lloyd, former CEO of Fluid (a digital agency) bringing substantial eCommerce user experience design sensibilities into the mix. Pixel-perfect control over website designs—overcoming some previous limitations on the control customers had over the layout, look and feel of sites. Enhanced search— indexing/search all data, all fields and eliminating differences between keyword search and parametric filters/faceted navigation. Speed improvements—using AJAX6 the system now sends only the data instead of serving up whole pages. The data is streamed and the page is assembled on the client. Responsive design is where the same page (same HTML code) responds to the characteristics of the device it is displayed on so that it is optimized for that desktop, tablet, or phone. This can work with future still-to-be-designed devices as well. The code is aware of the device’s screen size and resolution, and adapts the layout, images, and content dynamically. For example, larger buttons will appear on a tablet; swiping is supported where appropriate; content automatically re-positions for vertical layout; and so forth. A future version will be aware of the processor speed and other platform parameters as well, to make further adjustments in the UI based on those characteristics, too. Dynamic merchandising is an eCommerce capability where the NetSuite system dynamically decides what to display on the page being shown to the customer, based on data from any field in the NetSuite system. 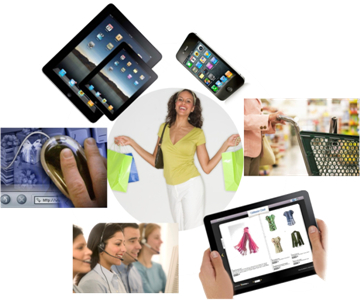 For example, you could offer a special promotion based on several factors such as a) how much the customer has spent, b) what items you have in excess inventory or that have higher margins, c) types of items the customer has purchased in the past, d) items in their cart or their top search terms, and so forth. One example given by NetSuite Example was if the merchant offers free shipping on orders above $150, it might create a rule that if the shopping cart is over $100, then it will suggest merchandise to get the customer’s order to over $150, based on the customer’s past buying, what products you want to move this week, and so on. Of course this can be done with other e-commerce systems, but NetSuite’s advantage is all of the data is already in their system and does not have to be integrated from another system. This type of dynamic capability might normally be beyond the reach of smaller firms who lack the resources to do that type of integration or customization project. Reflecting its emphasis on e-commerce, NetSuite has created a whole new “NetSuite Agency Program” to recruit creative agencies as partners and train and support them on SuiteCommerce and SuiteCloud platforms. 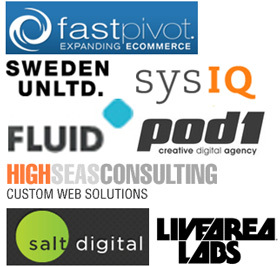 They already have some of these next generation design firms as partners, such as Fluid, Pod1, LiveAreaLabs, Salt Digital, SysIQ, FastPivot, High Seas Consulting, and Sweden Unlimited. I would speculate that Andy Lloyd had a hand in this as well. It gives NetSuite customers access to digital creative agencies that are trained on the platform, which should further stimulate the building of more diverse, unique, innovative, and interactive sites on the NetSuite platform. NetSuite has a different approach to providing deep vertical or domain-specific functionality than the larger and more traditional ERP and best-of-breed supply chain vendors such as Oracle, SAP, JDA, and Manhattan. The traditional vendors lean towards building that deep vertical functionality themselves, or acquiring companies with those assets. In contrast, NetSuite relies on a combination of in-house development, the customizability of their solution (proving that you can be a multi-tenant single-instance solution and still be highly customizable) and best-of-breed partners. NetSuite offers industry-specific solutions across the following key verticals: Wholesale Distribution, Manufacturing, Service, Software, and e-commerce (though I think it is a bit odd that they consider e-commerce to be a vertical … it seems to me it is a horizontal capability across industries). In fact each of their five verticals has its own dedicated sales, marketing, support, professional services, development, and product management teams, so in that sense they do take those sectors seriously with significant market traction and customers. 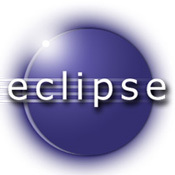 Having said that, if you look at, say, the transportation management functionality of JDA or Oracle, or the industry-specific functionality of SAP, or the warehouse management functionality of Manhattan, NetSuite’s built-in functionality trades off some of these deeper features for greater flexibility, extensibility, and ease-of-use. NetSuite relies on partners to provide that depth of functionality.7 As one NetSuite product manager put it, “Partners are a very strategic and deliberate compliment to our own development team.” Over the last 6-9 months, they have added more training, up-front integration, and combined project management capabilities for their partnerships. In Founder and CTO Evan Goldberg’s keynote on day two, he framed his key points around “accelerating development.” For example, they developed a new capability called Transaction Timeline (see Figure 2) that provides a visual timeline of the steps in the opportunity-to-cash and procure-to-pay processes. This process-oriented view of the end-to-end transaction streams allows the user to drill down and back up. Evan made the point that this feature was not developed through NetSuite’s normal scrum process,9 but rather through their ‘sprint of dreams’ where they assemble teams from all over the world, give them a few days to present an idea, and then a panel of judges including Zach, Evan, and Jim McGeever10 vote on it. Transaction Timeline was the winner this year. Since NetSuite was founded by a software engineer, and they run their own company on NetSuite, it is not so surprising that they are more focused on software company clients than any other significant ERP vendor I’m aware of. Although the software sector is only about 2% of the size of wholesale, manufacturing, and service sectors,11 yet it is considered a key sector by NetSuite. In his keynote Evan announced (to enthusiastic applause) the introduction of NetSuite Recurring Billing to address many of the challenges of ‘as-a-service’ billing such as: billing in advance vs. arrears; recognizing SaaS revenue; billing for usage; and contract renewals. 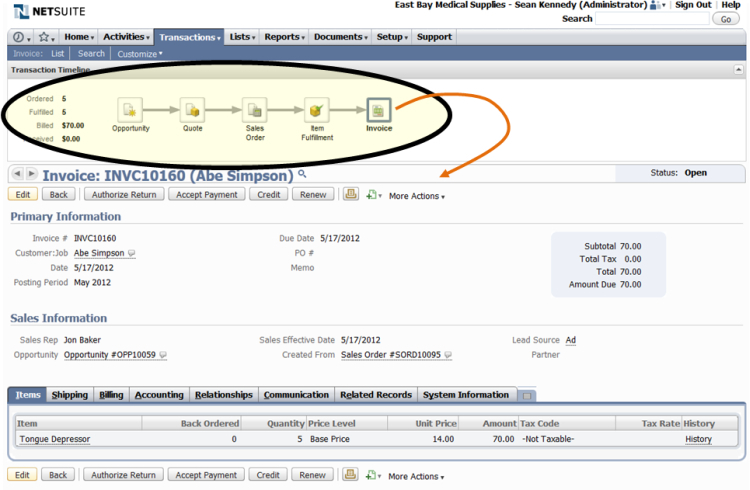 This integrates the necessary ERP financial functions (General Ledger, revenue recognition, payments, item fulfillment) with eCommerce (web storefront, ‘Billing Commerce Center,’ ‘My Subscriptions,’ payment, renewals, account management) and CRM (forecasting, managing renewal opportunities, commissions, email campaigns). It supports the ability to mix and match different rules in a single subscription and to customize and use any billing basis (“if you can count it, we can bill it”). Evan also announced capabilities for the other verticals. For example a ‘project dashboard’ for professional services companies that gives a holistic summary view of key project information such as: start/end dates, % complete, utilization, amount invoiced, margins, custom KPIs, and gantt chart views of project tasks’ current status. For manufacturing industries, NetSuite’s roadmap includes BOM12 component effectivity, routings, ABC13 cycle counting, and WIP inventory (currently NetSuite does not distinguish between raw materials and WIP inventory). For wholesale distribution, Evan announced ATP (Available-to-Promise) business rules that can allocate and peg inventory against each order. And for multi-division, multi-national companies, he announced multi-book accounting, where the underlying transactions can be automatically stored on two or more different books, based on the accounting rules that vary by country or region (e.g. US GAAP, vs. UK GAAP, IFRS, Japan GAAP, etc.) to account for differences in revenue recognition, fixed asset depreciation, expense amortization, FX translation, inventory COGS, and so forth. In my follow-on article about what I learned at SuiteWorld, I’ll talk about what some of NetSuite’s customers are doing, particularly in the Wholesale Distribution sector.